We work in partnership with you to find and perfect the story you want to tell in your wedding speech. The first step is to have a chat on the phone. This is completely free and allows us to work out where you are in the speech process, and gives you a chance to see how we operate before you commit. Together we’ll agree the way forward. Just as every speech is different, so is the way we work with every wedding speaker. The packages detailed below outline the levels of support that we offer. 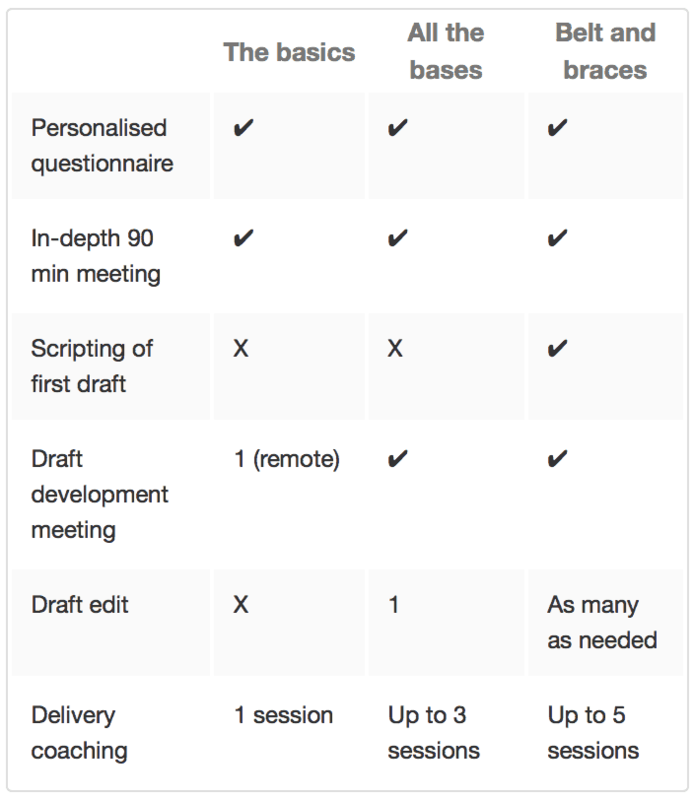 For people on a budget, but still keen to create a memorable speech, the basics package provides a personalised material gathering tool, an in-depth meeting to outline the structure of the speech, followed by a remote session to evaluate your draft and one delivery session. Our most popular package provides you with comprehensive help throughout the process. We help you with the gathering of your material, the creation of the speech structure, draft evaluation and detailed editing. Once you have the text as you want it we start work on the speech delivery. You can have up to three personalised coaching sessions to ensure you are ready for the big day. This is your concierge service, a complete package that gives you support every step of the way, from the blank page to your wedding speech dress rehearsal. In addition to helping you with the gathering of material, and an in-depth meeting to establish the structure of your speech, we will draft it for you. Together, we edit the draft in detail, finessing it until you have a text with which you are completely happy. Finally, there is the full delivery coaching programme of up to five sessions, and we’ll be on hand throughout the process for help, guidance and last minute preparation tips. Book your free telephone consultation on your speech via the contact form, get in touch via email or just give us a call. Together we will assess your needs and make a plan.